You can view your water provider’s Consumer Confidence Report at any time from EPA’s website. The Consumer Confidence Report (CCR) rule is part of the 1996 Amendments to the Safe Drinking Water Act. The rule requires every community water system to prepare and distribute an annual water quality report (CCR) to their customers to provide consumers with information on the quality of their drinking water. The CCR Rule specifies a framework that water suppliers must use to give consumers information on their drinking water. Information on the following topics must be included: water source(s); contaminants detected in finished water; health effects of contaminants when violations occur; likely sources of detected contaminants; and the findings of source water assessments. The CCR Rule also specifies that a Certification Letter shall be provided to the State. This letter shall certify that the CCR has been distributed to customers, and that the information is correct and consistent with the compliance monitoring data previously submitted to the Utah Division of Drinking Water. The Division of Drinking Water generally holds regional workshops to assist systems in completing CCR reports. A copy of the CCR report for the previous calendar year must be distributed to customers and submitted to Division of Drinking Water by July 1. Furthermore, a certification letter regarding the previous year’s CCR must be submitted to Division of Drinking Water annually by October 1. To illustrate, when a community water supplier publishes a report for the calendar year 2002, it must be made available to their customers by July 1, 2003. The Division of Drinking Water shall also receive a copy of the CCR by July 1, 2003. Furthermore, a certification letter for the 2001 CCR must be received by DDW no later than October 1, 2003. 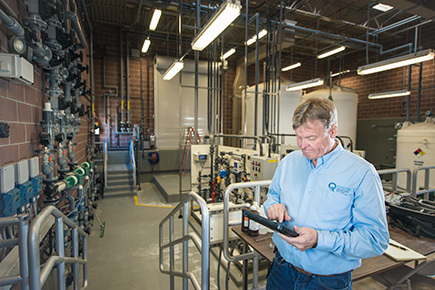 Submitting the CCR report and the certification letter to the Division of Drinking Water simultaneously is highly recommended to minimize confusion and simplify the tracking process. Electronic versions of CCRs, or links to on-line CCRs, will be accepted in lieu of hard copies. Email to Colt Smith. However, a signed, printed copy of the Certification Letter must be mailed to the Division. Upon receipt, both the CCR and the Certification Letter will be reviewed by Division staff to verify that minimum requirements have been met. Common errors noted in a large percentage of CCRs. EPA’s rules for their annual water quality and drinking water reports. Contains information on preparing a CCR. Helps water suppliers quickly create CCRs. Appendix F, contains sample CCRs. Provides CCR technical assistance to member systems by providing a CCR template and help. Contact them at RWAU.net.